For other uses, see Soufflé (disambiguation). A soufflé (French: [su.fle]) is a baked egg-based dish which originated in early eighteenth century France. 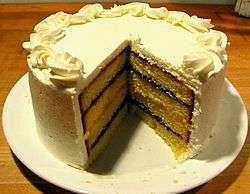 It is made with egg yolks and beaten egg whites combined with various other ingredients and served as a savory main dish or sweetened as a dessert. The word soufflé is the past participle of the French verb souffler which means "to breathe" or "to puff". The earliest mention of the soufflé is attributed to French master cook Vincent de la Chapelle, circa the early eighteenth century. The development and popularization of the soufflé is usually traced to French chef Marie-Antoine Carême in the early nineteenth century. The base provides the flavor and the egg whites provide the "lift", or puffiness to the dish. Foods commonly used to flavor the base include herbs, cheese and vegetables for savory soufflés and jam, fruits, berries, chocolate, banana and lemon for dessert soufflés. Soufflés are generally baked in individual ramekins of a few ounces or soufflé dishes of a few liters: these are typically glazed, flat-bottomed, round porcelain containers with unglazed bottoms, vertical or nearly vertical sides, and fluted exterior borders. The ramekin, or other baking vessel, may be coated with a thin film of butter to prevent the soufflé from sticking. 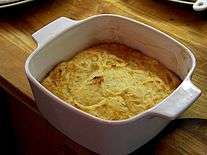 Some preparations also include adding a coating of sugar, bread crumbs, or a grated hard cheese such as parmesan inside the ramekin in addition to the butter; some cooks believe this allows the soufflé to rise more easily. After being cooked, a soufflé is puffed up and fluffy, and it will generally fall after 5 or 10 minutes (as risen dough does). It may be served with a sauce atop the soufflé, such as a sweet dessert sauce. When served, the top of a soufflé may be punctured with serving utensils to separate it into individual servings. This can also enable a sauce to integrate into the dish. There are a number of both savory and sweet soufflé flavor variations. Savory soufflés often include cheese, and vegetables such as spinach, carrot and herbs, and may sometimes incorporate poultry, bacon, ham, or seafood for a more substantial dish. Sweet soufflés may be based on a chocolate or fruit sauce (lemon or raspberry, for example), and are often served with a dusting of powdered sugar. Frugal recipes sometimes emphasize the possibilities for making soufflés from leftovers. Another variation is an ice cream soufflé, which combines a soufflé with ice cream. Fruit or a hot dessert sauce, such as chocolate sauce, may also be used. Soufflés are frequently depicted in cartoons, comedies and children's programs as a source of humor. Often this involves a loud noise or poke causing the soufflé to collapse, evoking the dejection of the character being served the anticipated dessert. In the popular science fiction television show Doctor Who, companion Clara Oswald's echo Oswin Oswald was known to the Doctor as "Soufflé Girl". On the animated children's television series Arthur, the episode "Arthur's Family Feud" involves a ruined soufflé. On the second season of HBO's series True Blood; Maryann Forrester (a Maenad and main antagonist of the season) created and served the "Hunter's soufflé" which had a range of ingredients including rabbit, vegetables flambéd and a human heart. The unsuspecting Tara Thornton and Benedict Talley subsequently fell under the maenad's spell after consuming the morbid dish. In The Brady Bunch episode "Vote for Brady," Alice bakes a soufflé. Throughout, the kids make various noises, none of which are sufficient to deflate it. However, the moment it's done baking, Alice knocks over a cutting board and it falls, much to her disappointment. The American competitive cooking reality show MasterChef frequently features soufflés in their Pressure Test. The second Australian version of reality show The Amazing Race had the teams baking soufflés in a Roadblock when they visited Le Cordon Bleu in Paris. 1 2 3 4 Peterson, J. (2012). Glorious French Food: A Fresh Approach to the Classics. Houghton Mifflin Harcourt. pp. 130–132. ISBN 978-0-544-18655-2. 1 2 3 4 5 6 Taylor, Carol. "How to Make a Soufflé". Mother Earth News. Retrieved 17 August 2015. ↑ "Soufflet". cnrtl.fr. Retrieved 18 August 2015. ↑ Wells, Patricia (22 February 1978). "Perfect Souffles Don't Require Expert Skills". The Eagle. p. 26 – via Newspapers.com. ↑ Mallet, Gina (2004). Last Chance to Eat: The Fate of Taste in a Fast Food World. W. W. Norton & Company. pp. 52–54. ISBN 9780393058413. 1 2 3 4 5 Cloake, Felicity (15 September 2011). "How to cook perfect cheese soufflé". The Guardian. Retrieved 17 August 2015. ↑ McCoy, J. (2009). Healthy Meals for Less. Baker Publishing Group. p. 231. ISBN 978-1-4412-1087-6. ↑ Beard, J. (2015). The James Beard Cookbook. Open Road Media. p. 356. ISBN 978-1-5040-0449-7. ↑ Brownlee, H.; Caruso, M. (2007). The Low-Carb Gourmet: A Cookbook for Hungry Dieters. Random House Publishing Group. p. 73. ISBN 978-0-307-41721-3. ↑ Rombauer, I.S. ; Becker, M.R. ; Becker, E.; Guarnaschelli, M. (1997). Joy of Cooking. Scribner. p. 1033. ISBN 978-0-684-81870-2. Retrieved 17 August 2015. ↑ Pellaprat, H.P. ; Tower, J. (2012). The Great Book of French Cuisine. Vendome Press. p. 1383. ISBN 978-0-86565-279-8. ↑ Zuckerman, K.; Rupp, T. (2009). The Sweet Life: Desserts from Chanterelle. Little, Brown. p. 170. ISBN 978-0-316-07033-1. 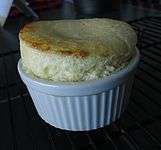 ↑ "The best way to prepare soufflé dishes or ramekins". Le Cordon Bleu. Retrieved 16 August 2015. ↑ Waldo, M. (1990). The Soufflé Cookbook. Dover Publications. p. 225. ISBN 978-0-486-26416-5. ↑ "Shivi Ramoutar's coconut soufflé with rum sauce". Metro. 1 July 2013. Retrieved 17 August 2015. 1 2 Lewis, E. (2013). In Pursuit of Flavor. Knopf Doubleday Publishing Group. pp. 488–490. ISBN 978-0-385-35082-2. ↑ Child, J.; Bertholle, L.; Beck, S. (2011). Mastering the Art of French Cooking. Knopf Doubleday Publishing Group. p. 331. ISBN 978-0-307-95817-4. ↑ Hesser, Amanda. "The Modern Souffle: Bastion of Strength". The New York Times. Retrieved 23 August 2015. ↑ Tijerina, Edmund (7 May 2015). "Recipe Swap: Carrot Soufflé". San Antonio Express-News. Retrieved 17 August 2015. ↑ "Chef John Folse's Holiday Carrot Soufflé". WAFB 9 News. 6 November 2001. Retrieved 17 August 2015. ↑ Mushet, Cindy (2008). The Art and Soul of Baking. Andrews McMeel Publishing. p. 375. ISBN 9780740773341. ↑ "Good Cookery: Souffles, alias Puffs". Fitchburg Sentinel. 9 May 1899. p. 11 – via Newspapers.com. 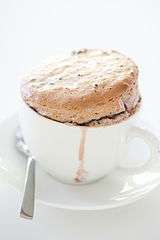 ↑ "Warm Milk Chocolate Souffles with Vanilla Ice Cream Recipe". Epicurious. 1 November 2002. Retrieved 17 August 2015. ↑ Walker, Jennifer A. (5 June 1997). "There is No Mystique to Making Mistake-Free Souffles". San Bernardino County Sun. p. 65 – via Newspapers.com. ↑ Nguyen, Hanh (18 May 2013). "Doctor Who Finale Explains the Impossible Girl and Introduces a New Face". TV Guide. Retrieved 16 August 2015. ↑ "Oswald for the Win! 13 of Clara's Best Moments...". BBC News. 12 June 2015. Retrieved 17 August 2015. ↑ "Arthur's Family Feud / Muffy Gets Mature". TV.com. Retrieved 16 August 2015. Waldo, M. (1990). The Soufflé Cookbook. Dover Publications. ISBN 978-0-486-26416-5. 241 pages. Wikimedia Commons has media related to Soufflé.